A solo exhibition by Motohiko Odani at the Mori Art Museum. Motohiko Odani, born 1972, studied sculpture at Tokyo University of the Arts and in 2003 represented Japan at the Venice Biennale. “Phantom Limb” is his largest solo exhibition to date and boasts a large number of new works (fourteen), making it both a great introduction and an exploration of his oeuvre for those more familiar with his sculptures. 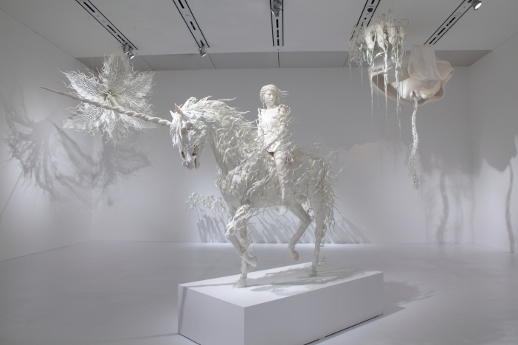 Part of the 2010 exhibition program of redefining Japan, it is an attempt by the Mori Art Museum to showcase the best of contemporary Japanese artists, and Odani is a good choice under this remit. The show takes its title from that of a photo print series depicting a young girl in an almost crucifix-like pose, with hands stained red from raspberry juice. Although the wall text talks about his personal experience of the sensation, he is creating an image that becomes more of a space to project our own imaginary sensations of what that might feel like. Stating that he hopes to “give form to what the eyes cannot see…the phantoms that are hidden inside us,” his work (as if by a process of transference) is full of unsettling sensations: unsettling because they feel contradictory. He achieves this by utilizing a broad range of materials: the first room contains a dress made of human hair (‘Double Edged of Thought [Dress 02]’, 1997), a stuffed fawn with a cast aluminum leg-restraining device (‘Erectro [Bambi]’, 1998) and a dress made from the heads and bodies of two wolves (‘Human Lesson [Dress 01]’, 1996), alluding to the mythological story of Amala and Kamala, girls said to have been raised by wolves. This is an exhibition reaching at the larger themes of death, love, national identity and the ethereal spiritual side of life. 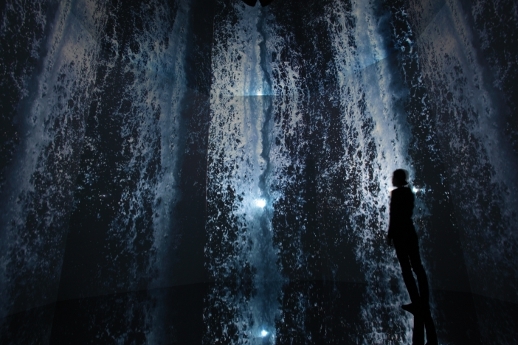 Abstract concepts such as movement and dynamism also provide a counterpoint, as the new piece ‘Inferno’ (2008-10) – an installation space with a projection of water along the side and a glass floor – vividly demonstrates. Because rooms categorize the show by material and theme it is possible to observe the struggle to form a language that is more than an artificially created polarity between supposed binaries: pain/pleasure, life/death, and beauty/ugliness. His works, like the sculpture of Helen Chadwick, convey something visceral, but unlike Chadwick’s work there is an observational distance. It is as if he is producing the works then standing outside of them to analyze them – questioning his own role in their creation. The video work is interesting in that the pieces introduce an element of the narrative of material and participator. In his pastiche of the ‘Texas Chainsaw Massacre’ he playfully reenacts the part of the main protagonist, thus becoming simultaneously a creator and destroyer. In ‘Rompers’ (2003) a Katy Perry lookalike sits aloft a tree watching honey drip, frogs sing and animals dance. This is fake nature but also hyper real libido-rich nature, where sensations are manufactured to entice and entertain like a TV show. In the final large rooms we are presented with more “traditional” works, in the sense that they are taken from the human form in some way: Japanese Noh masks are sliced in two and altered; Meiji era-inspired statues of figures aloft horses undermine the heroic imported Western model of representation by becoming spectral, the figure stripped of skin; a girl is pictured closing her eyes to enter a “psychologically blind” state; a woman clutches a heart. The next room is full of white spectral figures or body parts that seem to float or hang, as if part of suspended animation. The final room contains a single video showing a white background with bubbles containing Odani’s own blood falling and bursting. It is literally bloody but strangely beautiful. Like the photo work it elicits a similar sensation – of something painful and difficult to articulate. Odani is not afraid to explore formal concerns of sculpture in depth, as well as engage with more psychological and ontological concepts. However, perhaps the scope of this show is rather too ambitious in its rhetoric and vague to satisfy die-hard art fans.